The funkiest Clinton of them all? 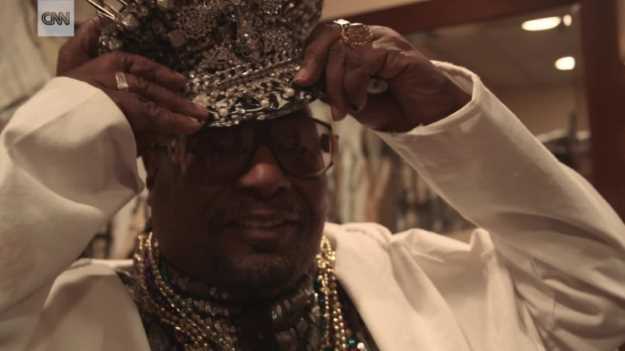 (CNN): At 75 years old, the self-proclaimed "godfather of the funk" shows no signs of slowing down. George Clinton, the singer, songwriter and mastermind behind legendary bands Parliament and Funkadelic, still gets funky around the world and is currently performing his epic catalog of music before sold-out audiences in the US. "We're here. We ain't going nowhere. We are a movement," Clinton said when CNN caught up with the Grammy-winner at New York's BB King Blues Club. After all, Clinton said, "funk is the DNA of hip-hop -- it's what made it possible. From Tupac to Snoop Dogg to Ice Cube, so many hip-hop artists have sampled the funk, and I'm glad they did because that's what kept it alive." Clinton rose to fame in the late '70s with his live album "The Mothership Connection," a record steeped in psychedelic and Afrofuturism references and influenced by Jimi Hendrix, Sly Stone and Frank Zappa. He later cemented his superstar status with the release of several No.1 hits, including "Flashlight," "Atomic Dog" and "One Nation Under a Groove." Speaking of "One Nation," Clinton said, "That's the holy grail of the funk. It's ... our anthem and that binding force." It's also a song Clinton thinks President Trump's administration should add to its playlist. "Ain't no funk in the Trump," Clinton said. "You can't be that against everything and everybody and be funky -- that's hard to do. He needs to go to a good funk concert a few times. He'd probably change his mind about a lot of things. I'm going to send him a copy of 'One Nation Under a Groove' -- maybe that'll help." In addition to talking politics in his conversation with CNN, the Rock & Roll Hall of Fame inductee discussed his influence, who influenced him, and how he thinks funk can help bring the world together. CNN: When you and your band were getting your start, who were some of your biggest musical influences? Clinton: I pay attention to all music, no matter who sings it, or where it comes from. Coming up through the industry, the Beatles influenced us a lot. The Beatles to me has always been like a movement, and with P-Funk that's what we were aiming for -- to be our own movement. So when I approached making music, I always thought in terms of making a phenomenon that wouldn't die and branding who we were just like they did. It wasn't about having the hit single. We made albums and that's how we built our lasting success. And it's worked, because right now we don't have any new hit singles, but we still work as much as any group with a hit. And we have as many fans as somebody who just had a hit record. CNN: Through hip-hop, your music has taken on new life. How does it feel to know you are inspiring a new generation of musicians? Clinton: First of all, I was so proud that kids were able to identify with their parents' music because that usually doesn't happen. So when it did, I embraced it. And through all of the people who have sampled my music, it's given new life to it. I had so much fun working with Kendrick Lamar on his album "To Pimp a Butterfly." When I met him I thought, "Wow. To be so young, he's really got an old soul." He and I talked for hours about stuff that I talk to old people about, but it felt natural because he had studied so well and knew so much about music's history. CNN: Speaking of bridging generations, considering our current political climate, what role do you think music plays in bringing people together? Clinton: Through music you can bring everybody together. When we play shows, we bring out every nationality, every age group. We can go to Hong Kong and they're singing "One Nation" -- and some of them don't even speak English but they say the lyrics perfectly. Tokyo, the same way. That's because that song speaks to everybody. Now we advanced it to "One Planet Under a Groove," because that is what's needed right now. In music we say "everybody on the one" -- it means everybody be in unison. And today we need to get "everybody on the one" at the same time. You can't help but get along if you're concentrating on togetherness like that.